The internet has been losing it’s mind. Well, my version of it, anyway. Over the last 20 hours my feeds in Twitter and Facebook, as well as my inbox, have been full of messages about a product called “No More Tea Bags”. Now, while “No More Tea Bags” sounds like a slogan that I would carry, marching along a street – and in fact, I have created and owned tea-shirts with similar sentiments – this is not about a return to proper, loose leaf tea. No indeed. Brace yourselves: It is, in fact, about squirtable, concentrated tea in a can. Phew! That was quite hard to type. We must calmly reserve judgement until we have properly researched this. It may be sensational, high quality tea. We must be open to new ideas… really, just samovar tea with a pause between brew and serve. At this point, I’m sure some people thought it was the end times a-startin’. And perhaps it is the end times. What drove me from my warm bed on this chilly morning is the thought this might be a hoax. A scam to get a gazillion likes (or otherwise) on Facebook. I’ve had a look at the site. I’ve even requested a sample for review (no response yet). I’ve looked at the company behind it. Despite a few spelling and grammatical errors, it seems pretty genuine. So, I checked with snopes.com. I searched for ‘tea’. I found myself drawn to reading “Is there worms in Lipton’s tea?” and “Spider tea?”, and pointedly ignoring posts about “the Tea Party” (which may indeed be an elaborate hoax), but I found nothing about it. Reluctantly, I have concluded it’s not a hoax. Seriously, what if it is? The whole point with my hatred of teabags is the inferior nature of the experience? What if this isn’t? What if this is actually a delivery method for decent tea, brewed properly? Their in-built argument about controlling the strength is indeed a great reason to use a samovar. They have no ingredient list on line: It may be pure, brewed tea. Alternatively, it may well be a combination of cornstarch, E300, E420, bathwater, kitten whiskers and 100% pure leaf tea extract (2.3%). Think of the convenience of spray cheese. No, stop thinking about spray cheese. What we don’t have is a benchmark. Is it as good as, better than or even inferior to bagged tea? And is that the technology or the tea? 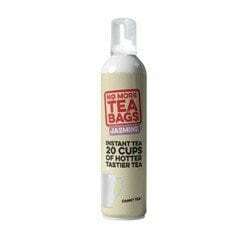 Could you take a brilliant tea and make it into a brilliant aerosol tea? And after all, this is a British product, and when it comes to tea, Britain has a reputation for great tea that is a complete sham. The vast majority of cups drunk in the UK are swill, pure and simple. This is a country that, for the most part, thinks a Twinnings teab*g is a premium product. I am going to reserve judgement about the actual product until I try it. To me, the worst thing here is that the product info tries to lump loose leaf tea and teab*gs together as messy and difficult. It’s an outrage, because it assumes you get a similar product. We simply can’t let that happen. We don’t want to seem like we are arguing over the best type of horse to pull our carriages whilst cars are whizzing by. The stereotype of tea as “messy and difficult”, which is just pathetic, get a new lease of life as any demand for this product tends to reinforce it. This isn’t the first time people have tried to “improve” tea by making it ‘more convenient’. On an Army Cadet camp circa 1980, some scallywag offered me a cup of tea made from powdered tea. “All tea will be made like this soon”, he confidently predicted. I assume he’s in prison now. Nevertheless, we must go about our business as we should. We must not let this get to us. We must not prejudge. If the product is awful, then we must take all reasonable steps, such as disinheriting children who offer it, overturning tables in restaurants or burning down the odd supermarket in protest. If it’s not, we must embrace it. I can assure you, though, as I sit here nursing a lovely cup of Jim’s Caravan tea, such an embrace seems unlikely. In Australia, we have an adjective that I am now compelled to use. I know to the rest of the world it seems like a noun- and a very crude one, but to us, it’s a treasured adjective. When all is said and done, I suspect that this product will be shithouse. Or maybe, it’s just a storm in a teacan. A good review or should I say pre-reviewe to the product actually being available. I, for one, will need lots of convincing that the world really needs an aerosol tea. I find one of the joys of being a tea person is watching the tea leaves release their essence, flavor, and wellness in my cup. I’m imagining someone squirting it directly into their mouth and collapsing in a Homer Simpson-like tea coma. I appreciate your input on this – I’m still rather appalled. because we simply do not need aerosol tea. Tea was just fine before this. Why not focus on things that need fixing. It really doesn’t take that long to prepare a proper cup of tea and it doesn’t require a messy ordeal nor does it require a great deal of specialized equipment. Instead, I suggest that they make aerosol coffee (INSTEAD, not in addition to) because it seems like for the coffee folk – the caffeine can’t be delivered fast enough to suit them. “I responded thusly” and with a lot of second degree in your voice (yes, I heard it from here).